The Seva Stress Release is a series of acupressure points in a particular sequence that is designed specifically to ease the human stress response and support overall well-being. “Seva” (pronounced SAY-VA) is the Sanskrit word for compassionate service. Originally called the Shock/Stress Release, the Seva Stress Release was developed by the Soul Lightening Acupressure faculty after 9/11. It was created as a way to serve the community by treating people anywhere who were suffering from its traumatic effects. Seva was first used in 2001 to treat rescue workers at the piers in NYC, and has since been offered in many diverse settings, including at Walter Reed Army Medical Center in Washington, DC; on college campuses to teach students self-care; in villages in Honduras, Africa and India; in schools to help teachers and students release stress; in breast cancer support groups, in hospital wellness programs, and countless other community settings. The Seva Workshop is comprised of two parts (sometimes offered together). Part 1 is a three hour workshop that teaches The Seva Stress Release acupressure protocol for self-care. Part 2 is also three hours long and reviews the same protocol for sharing with others. Anyone can learn this simple yet effective way to help themselves and others (no previous bodywork experience necessary nor required). Each workshop is $60/$65. Participant holding her favorite points! 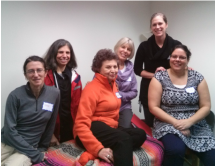 if you're a massage therapist, Asian bodyworker, or nurse, CEs are available! (details below). Contact Shira with any further questions regarding CEs. No workshops are currently scheduled! Please contact Shira and let her know that you are interested in this workshop. Once several people express interest, a workshop will be scheduled for this group. Or, you may wish to gather your own group and offer this workshop at your home, business, or a rented space. Contact Shira for details.